The producers and casting department of “Minute to Win It” NBC game show can be credited for getting the most well-suited people to take-on the unusual challenges that this unique game show demands. Those requirements don’t always consist of the most physically fit players, but sometimes the most determined or focused. Hiker and subject of “127 Hours” movie Aron Ralston on MINUTE TO WIN IT! The show has recently succeeded in finding and placing on it’s stage a particular individual who possess both qualities at their maximum! Who better to face these challenges than a man that survived being trapped by an 800 pound boulder inside of a cave! Host, Guy Fieri recently welcomed special guest contestant, Aron Ralston to play inside of the “60-second circle” for a chance to win money for his charity- “Wilderness Workshop”. Ralston is the real-life survivor whose story was told in his book Between a Rock and a Hard Place, that was made into a movie “127 Hours”. The movie has been nominated for six Academy Awards this year. Ralston’s calm, cool and collected behavior on-stage served him well in the game play. Fieri got a great first-hand account of Ralston’s experience while he was trapped in the Utah cave. A more candid and open Ralston stood in front of Fieri than the one shown in a recent interview aired on “Dateline” from 2003. 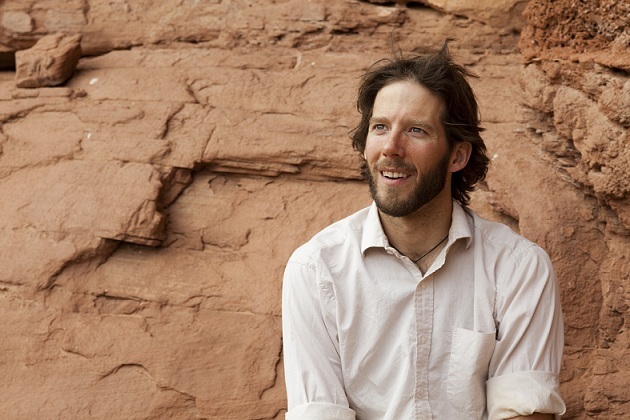 Ralston exuded positive energy onto the stage and explained what he took away from his own life-changing event that ended in the cutting-off of his own arm to set himself free from the boulder that kept him trapped inside the cave for five days and seven hours. In his own descriptive words, viewers of this episode will hear in detail how he did it. Ralston said that he was very happy with how James Franco depicted him in the movie, and that Franco was very interested in getting everything right about his story. Franco will host this year’s 83rd Academy Awards and is nominated for his portrayal of Ralston for “Best Lead Actor”. Franco makes a cameo on “Minute to Win It” to encourage Ralston. Ralston explained that what kept him alive was the thought of getting back to his sister and mother. But, the one thing that really pushed him to set himself free was when he had an out-of-body experience which lead him to his vision of his future son. “Minute to Win It” is a game show all based on timing. If a contestant doesn’t complete a stunt presented to them in the 60 Second Circle within the allotted 60-seconds, they lose a life. Each player starts with three lives. The very rescue of Ralston all weighed on timing. He happened to amputate his own arm on the very day that the search teams were looking for him. He happen to scale down the 65 foot cliff, travel back over a pool of water and just in time that he just happened to run-into hikers at the very time that the rescue helicopter just happened to be flying overhead. 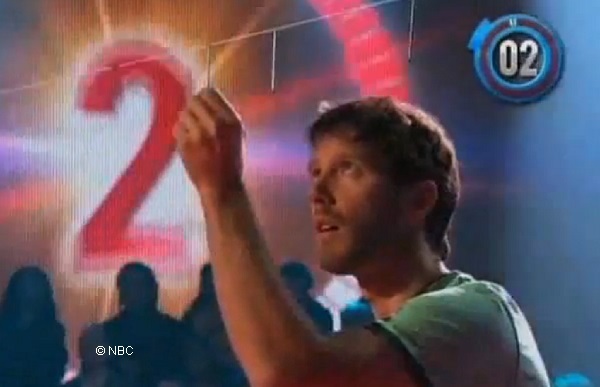 With timing and endurance like that, he has the perfect ingredients to play “Minute to Win It”. As a celebrity contestant playing for charity, he was allowed to bank his winnings after completing each round successfully. Ralston was born right-handed. It was the right arm that was pinned against the rock wall. He had to relearn everything with his left-hand. His challenges on “Minute to Win It” included: Whack Job, Hang Nails, Ping-Tac Toe, Just Knock it Off. Most of his games were played without the use of his prosthetic arm. He said that he looked at it as a tool and whether or not it would be useful in the playing of a challenge. Raslton’s mother and sister were present in the audience to cheer him on in his games. His mother stated that he was always adventurous as a child. She played a key roll in his rescue by discovering his whereabouts by hacking into his email then sending the search and rescue team to find him. Ralston displayed a playful sense of humor all throughout the game. He recounted that when the rescue ranger found him, he asked him “Are you Aron Ralston?” Jokingly, he said he wondered, “what if I wasn’t? :” Him and Fieri shared an ongoing joke that came from his reaction to how he doesn’t consider any one person better than another. “Everyone can do certain things better than other things”. Fieri reacted with “What about the guy that has two heads, six arms and wings and can fly. Clearly that guy is better!”. A brief explosion of laughter followed. Ralston’s biggest motivator for being on the show was as he explained – he has gotten so much out of nature, that he wants to give back. Ralston makes this episode of “Minute to Win It” the one not to miss! His profound statements and inspirational wisdom are worth it alone. 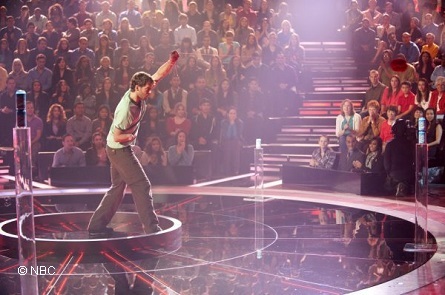 Watch this episode when it airs Wednesday, February 23 on NBC. The 83rd Academy Awards will air Sunday, February 27.